Photo Credit: Oceanside Fire Department. A chemical compound burst into flames as employees worked with it, sparking a fire that gutted a shop that manufactures surfboards Friday, injuring one person in Oceanside. The fire at Global Glassing Inc. in the 3200 block of Production Avenue erupted shortly after 11:30 a.m., near the Oceanside Municipal Airport. 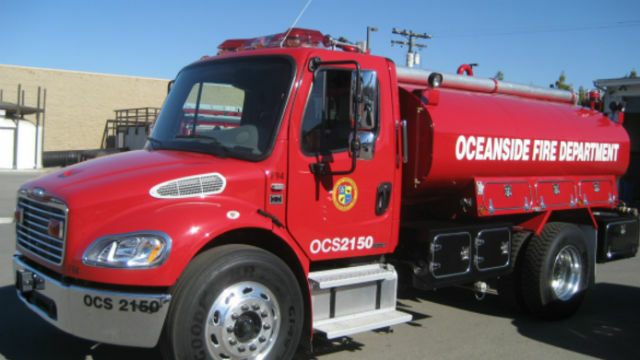 According to Oceanside fire department officials, it caused an estimated $500,000 in damage. Crews arrived to find heavy flames issuing from rear roll-up doors at the business, Battalion Chief Pete Lawrence said. Within several minutes, the roof over the burning part of the structure collapsed and the blaze began spreading more rapidly. “At this point, fire crews determined that there was no way to fight the increasing volume of fire inside the involved unit and pulled all personnel outside to begin defensive operations designed to limit the spread to the other businesses in the L-shaped building,” Lawrence said. It took crews from Oceanside and several neighboring areas nearly an hour to gain the upper hand on the blaze, which destroyed the unit in which it originated and damaged two others — a second surfboard shop and a smog-testing business. A Global Glassing employee reported that a crew at the facility was using acetone when it “flashed,” catching the immediate surrounding area on fire, Lawrence said. Another worker tried in vain to extinguish the flames, suffering burns to his face. He drove himself to a local hospital rather than seek treatment from personnel at the scene. Due to the presence of acetone, resin and other chemicals in the charred building, hazardous materials teams from Camp Pendleton and the city and county of San Diego were called in to evaluate the damaged areas and runoff.